An NBA player not shooting a free throw in a game is generally not news. When that player is James Harden, it most definitely is. Harden failed to go to the free throw line during Sunday’s 117-102 win over the Minnesota Timberwolves. He logged 20 points and 10 assists in the game, with each of his points arriving via one of his 24 field goal attempts. According to ESPN, that marks the first time Harden has failed to garner a free throw at home since he joined the Rockets in 2012. That marks a span of 303 regular season and playoff games that Harden shot at least one free throw. This season Harden averages 11.3 free throw attempts per game, which is good for best in the league lead by a wide margin. Joel Embiid is second in the league with 10 free throw attempts per game. Nobody else is in double figures. Harden drives opposing fans crazy with his knack for drawing fouls on jump shots, a style that’s not aesthetically pleasing but is highly efficient and effective. He wasn’t efficient on Sunday without the free throws, but he was still effective, posting a plus-20 in the plus-minus column as Houston picked up another win. 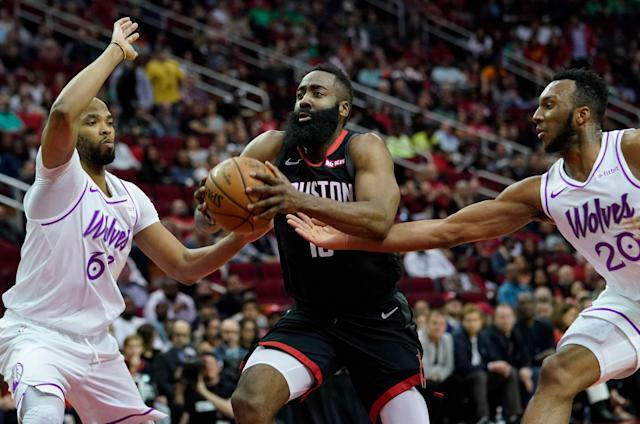 The Rockets have now won 11 of their last 12 games and surged to third place in the Western Conference after a slow start marked with injuries. They’re healthy now and looking much more like the team that took Golden State to Game 7 in the conference finals last season. And on Sunday, they won without one of the game’s most effective scoring strategies in action.